Organised by IT Academy STEP Cambodia and supported by USAID’s Development Innovations, the programme aims to encourage female students aged 10 to 18 to try programming, develop their confidence, and empower them to learn digital skills, explained Nataly Rodionova, the academy’s Managing Director. “First of all, we want to create a safe, encouraging, and supportive environment for female students to discover programming skills. We believe that the only female coding club can create a real sisterhood, that will empower girls for their skills development and further their career possibilities,” Nataly noted. The free coding classes are held every week, either on Saturday or Sunday, and offer students 3 topics to learn: Basics of visual coding, where students will be introduced to the algorithms and principles of programming though interactive and fun activities; game development basics; and web development with HTML/CSS. In June, this first batch of 32 students will present their coding projects, and organisers plan to double enrollment for the next cohort, to include students from select public schools. Recognising the underrepresentation of women in the IT industry, Nataly explained that only 8% of Cambodian students choose IT related subjects to study for their tertiary education. “According to the surveys we have conducted, many female students in Cambodia do not have enough support or encouragement from families and peers while choosing STEM subjects to study,” she added. 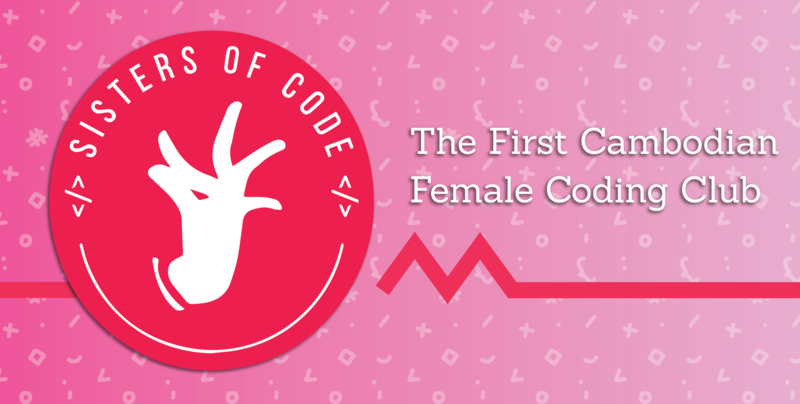 So if you are a female programmer interested in sharing your experiences with the students, or if you are interested in joining the programme, follow the Sisters of Code Facebook page HERE!